Download HP Photosmart C5280 Driver for Windows, Mac OS X, and Linux below this description. 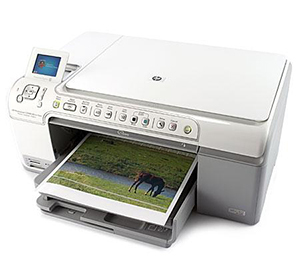 HP C5280 All In One Printer allows you to customize CDs and DVDs using your own photos, art and text. HP scanning technology and included software able to repair damaged photos, and make beautiful photo reprints at the touch of a button. In addition, create high quality photo scans with 4800 x 4800 dpi scan resolution. HP Photosmart C5280 make easily print photos from your memory card without a PC by using a 2.4 inch display and HP Photosmart Express. In addition, it offers print photos without swapping paper the automated photo tray engages whenever you print photos. Plus, you can edit, print and share photos by using HP Photosmart Essential software. You can also get more affordable printing with new high capacity inkjet cartridges to optimize print and copy quality. This download includes the HP print driver, HP Utility, HP Scan software and HP fax drivers. This download includes the HP Photosmart driver, HP Printer Utility, and HP Photosmart Studio imaging software for Mac OS X 10.3.9, 10.4 and 10.5. HP Photosmart C5280 Printers Driver Support for Linux OSFor Linux downloads, HP recommends another website. If you need to download Linux drivers, you will be directed to a website that is outside HP Customer Support.